New storyline time! So much snow. Speaking of which, if you’re in or around Western Massachusetts you should come to Webcomics on Ice! It’s gonna be a meet + greet/signing/arcade party that everyone’s sure to enjoy! Check out all these comics people! I will be there. I’ll have some books for sale and I’ll be doing sketches in signings and gabbing with folks. The event is totally free to attend and the Facebook event page with all the info is here. Hope to see you there! Will this end with Eve wielding an axe?? Every storyline should begin with characters emerging from a flipped van. …honestly, can you think of a story that begins with climbing out of a flipped van that isn’t good? …okay, so like a ‘go save the princess and kill the dragon’ type story might be a stretch. Knight Holmsfred stepped out of the flipped van, holding the roadmap upside down, appropriately. As soon as he found the tower with the dragon in it, he spoke into his walkie-talkie: “I’m in position… LAUNCH! !” and he sprinted away to a safe distance. From afar, a star appeared in the sky. But it was no star – it grew and grew until one could see its shape: a flaming great van. It landed with millimeter precision at the base of the tower, knocking it over and killing everyone inside it: dragon, guards, princess and all. “Oh, oops,” said Knight Holmsfred. Meredith, Did you get stuck in the snow this week? Love it that there is no explanation for the flipped van. I've got time now! And no booze to make it go faster! Yup, as somebody who lives in Vermont, this is pretty much how I feel when circumstances conspire to make booze inaccessible. I'd forgotten that Eve's full first name is Everest. Really apropos here. I'm detecting a 'The Shining' vibe going down. Julie and Jacob in the same wee mountain town? I don't think Eve's going to be the one wielding the axe. Wow, I'd have to say that "no booze" wouldn't have struck me as the first issue with Vermont — I live here, albeit in what passes for the big city (Burlington, pop. 38,889), and it's one of the few places I've lived that didn't have messed-up liquor laws at the time. No liquor stores in city limits (Lubbock, TX — since repealed), no beer over 3.4% available in public bars (Salt Lake City, UT — also since repealed), some incredibly byzantine systems of state-run liquor stores (both UT and PA). And then there was Milwaukee, where it was illegal to have a block with no bars on it. Even in Milwaukee, you can’t buy alcohol from a store after 9 p.m.
That's not fair. That's not fair at all. There was time now. There was all the time I needed…! That's not fair! True – how will Eve survive (putting up with Olly and) looking at all that snow, without her (reading?) drinking glasses? …only if you don’t know the right people. Then there is unlimited booze in the boonies. Granted, there is a slight chance of loosing your eyesight..
A graveyard in… the Twilight Zone. Oh, good. Jacob apparently plays guitar. This can't get any worse at all. I see no roadway… that van must've really flipped! This reminded me why I despised being stationed in Vermont for three months last year. No booze in an secluded 'lodge' in the middle of snow filled wasteland? Let's just hope this place isn't built over some American Indian grave yard or someone's gonna get an axe in the face! The flipped van reminds me of why I hate driving in Winter. Curious as to what’s up with the page quality? It’s a little fuzzy to me! Olly really didn't want anyone to escape this place. Poor Eve, stuck with co-workers and sober throughout. If this isn't an excellent way to open a story I don't know what is. …with regards to the van, that is. The second page from that last comic is still visible for me. Is it a caching thing or is it there for everyone? It's only on the homepage, not the specific strip page. It's deathly cold, the women wrapped like mummies and there's no booze. This is my hell. -Read it, saw last panel, thought "WHOA! SCOTT PILGRIM!" But that already happened. Look in the archives. 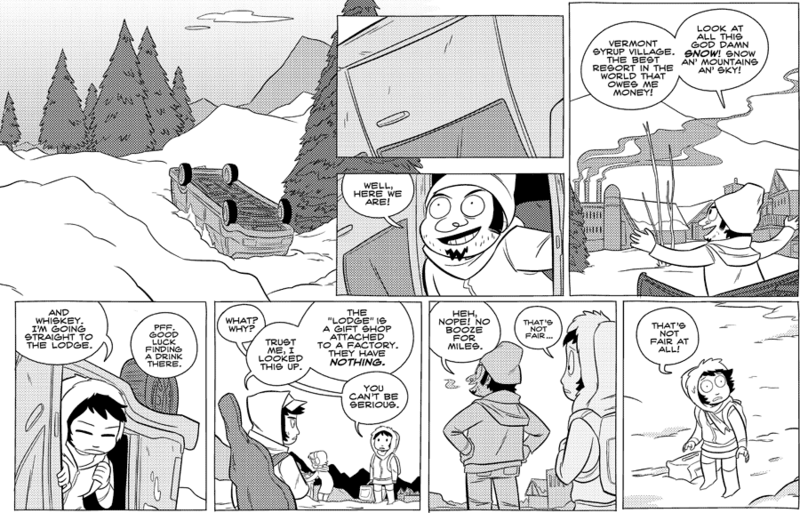 You know this storyline's gonna be good when it starts out with an upside down car in the snow. First thing I thought of was Twilight Zone. And I too am a fan of the mysteriously flipped van at the beginning. WHAT KIND OF VACATION DOESN'T HAVE BOOZE?! BLASPHEMY!